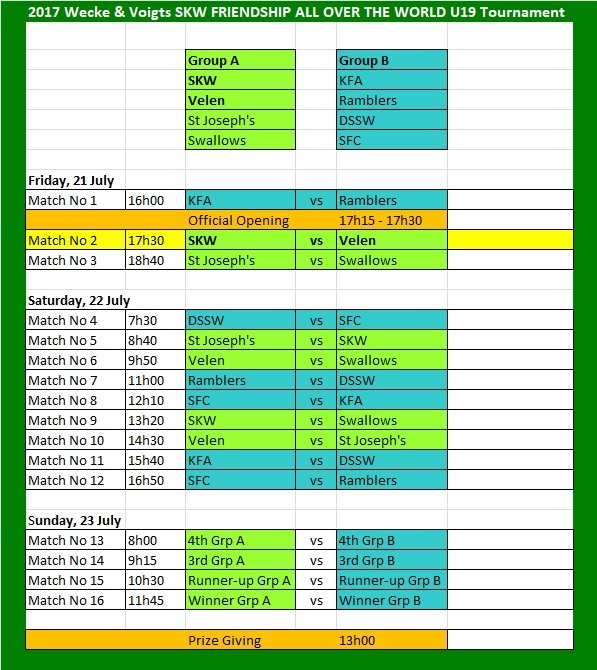 have TUS Velen here for the past weekend's tournament. This all came about because two years ago a SKW U19 team visited them and had a great stay and time in Germany. The trip to Germany two years ago and having Velen back here now is definitely a highlight for the players and coaches from SKW involved. But the club has to strive to and find a sustainable solution which offers all players of the SKW academy involved such or a similar experience. KFA, Swallows, St Josef and SFC for taking part, especially SFC travelling from so far. It is appreciated what certain clubs, soccer academy's and schools do for soccer at grassroots level and in the youth. Unfortunately this cannot currently be said from our governing body NFA, the NPL or the Khomas region. We just urge these bodies to get their house in order to make the investment in youth football worthwhile. A BIG THANK YOU to Mr. Dieter Voigts, representing Wecke&Voigts for sponsoring the SKW Youth Soccer Academy. This is really appreciated and much needed.